Originally published January 12, 2012 on Twitter, as part of my background image, not a tweet. I am @KentPitman there if you'd like to follow me. The title, added later, is a pun. 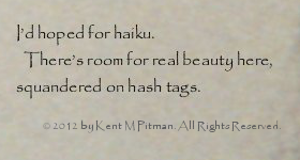 The haiku is both a comment on Twitter, and a celebration of my arrival on Twitter.